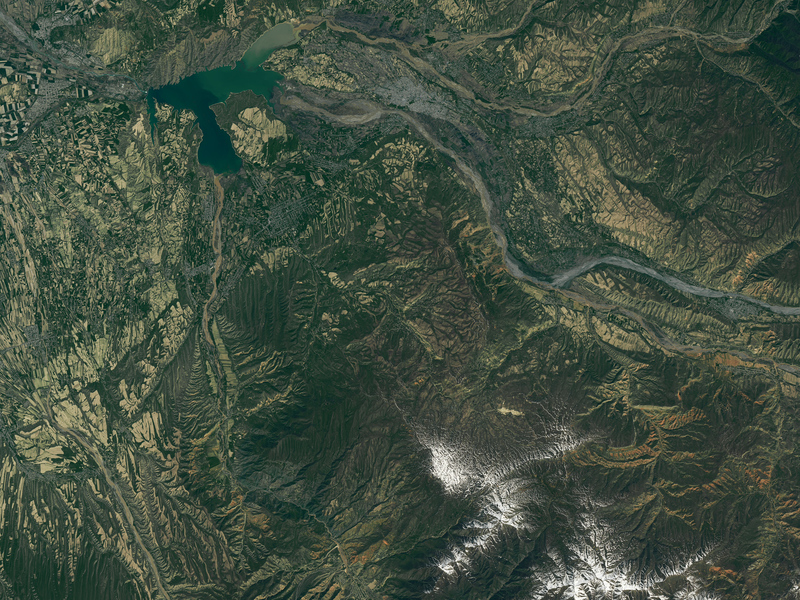 On May 11, 2017, the Operational Land Imager (OLI) on the Landsat 8 satellite captured an image (right) of the landslide deposit. Freshly exposed soil is tan. 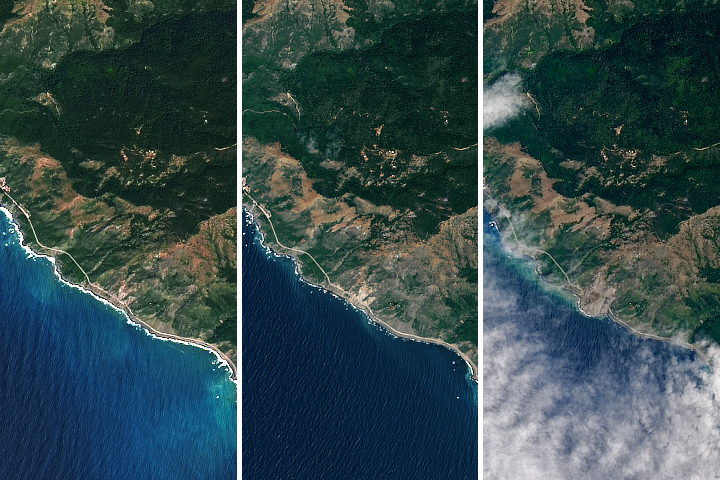 For comparison, the image on the left shows the same area on April 25, 2017. The landslide transported 2.8 million cubic meters (99 million cubic feet) of soil, according to Kyrgyzstan’s Ministry of Emergency Situations. People living in the foothills of the Tien Shan mountains in southern Kyrgyzstan face an unusually high risk of landslides. Several factors contribute to the elevated risk, including the presence of active faults, steep terrain, and the presence of landslide-prone soil types. 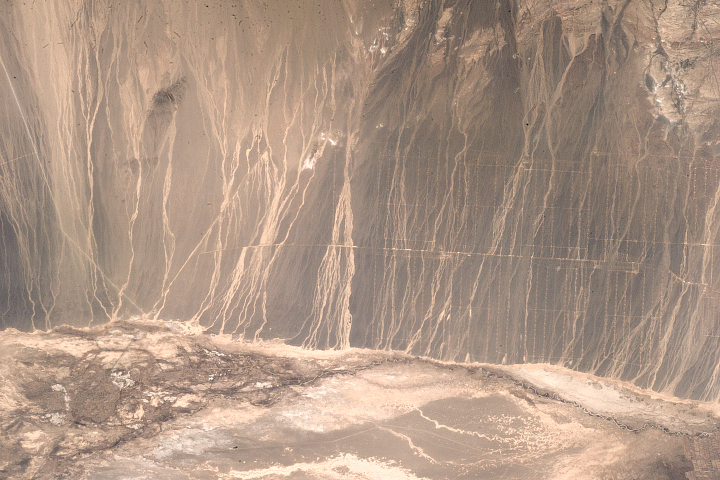 Loess, for instance, is involved in many landslides in this region because the fine-grained soil becomes quite unstable when saturated with water. 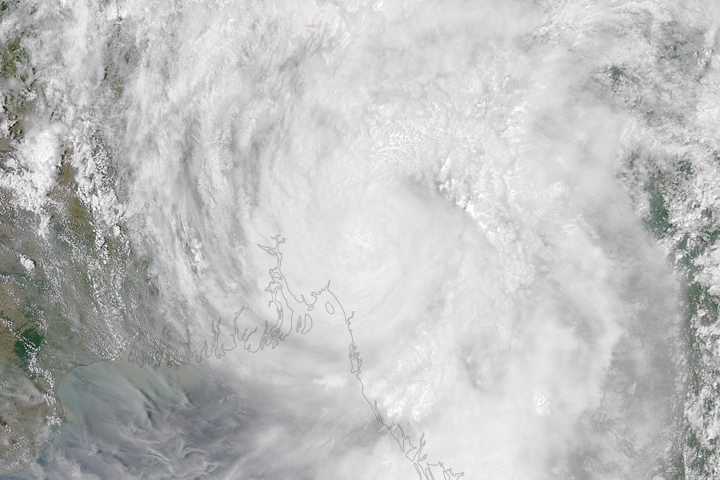 Heavy bouts of rain, the melting of snow, and small earthquakes often trigger slides. The risk is particularly high in the spring, when heavy rainfall is most likely. 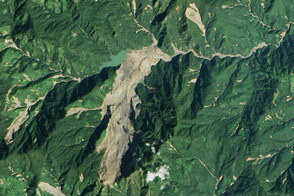 Since the area is densely populated, landslides take lives and destroy many homes each year. 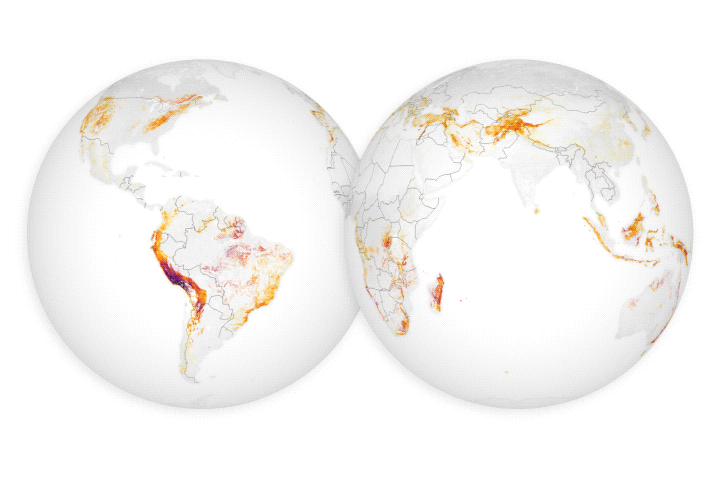 To learn more about landslides, see this global map of landslide susceptibility. AKIPress (2017, May 8) Creeping landslide engulfs 36 homes in Uzgen. Accessed May 23, 2017. AKIPress (2017, May 18) Moving landslide covers 57 houses in Uzgen. Accessed May 23, 2017. Derybyshire, E. (2001, June) Geological hazards in loess terrain, with particular reference to the loess regions of China. Earth-Science Reviews, 54 (1-3), 231-260. Dannels, G. et al. (2008, September 15) Geophysical investigation and dynamic modelling of unstable slopes: case-study of Kainama (Kyrgyzstan). Geophysical Journal International, 54 (1-3), 231-260. KABAR (2017, May 5) Humanitarian aid rendered to victims of landslide in Uzgen. Accessed May 23, 2017. KABAR (2017, May 1) Landslide sweeps over 11 more houses in southern Kyrgyzstan. Accessed May 23, 2017. Ministry of Environment and Emergency (2017, May 3) Cause of Activation of Landslide Processes. Accessed May 23, 2017. 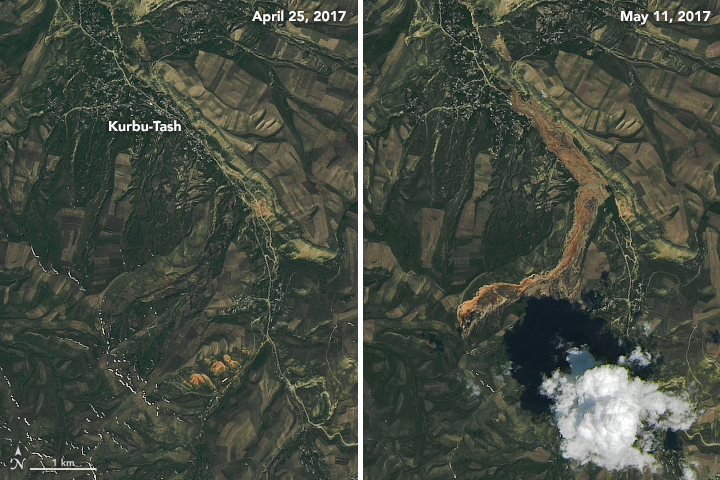 The Landslide Blog (2017, May 3) Kurbu-Tash and Ayu: the location of the two large landslides in Kyrgyzstan this weekend. Accessed May 23, 2017. The Landslide Blog (2017, May 17) A new video of the giant Kurbu-Tash landslide in Kyrgyzstan. Accessed May 23, 2017. Roessner, S. et al. (2005) Satellite remote sensing for regional assessment of landslide hazard in Kyrgyzstan (Central Asia). Natural Hazards, 35 (3), 395-416. 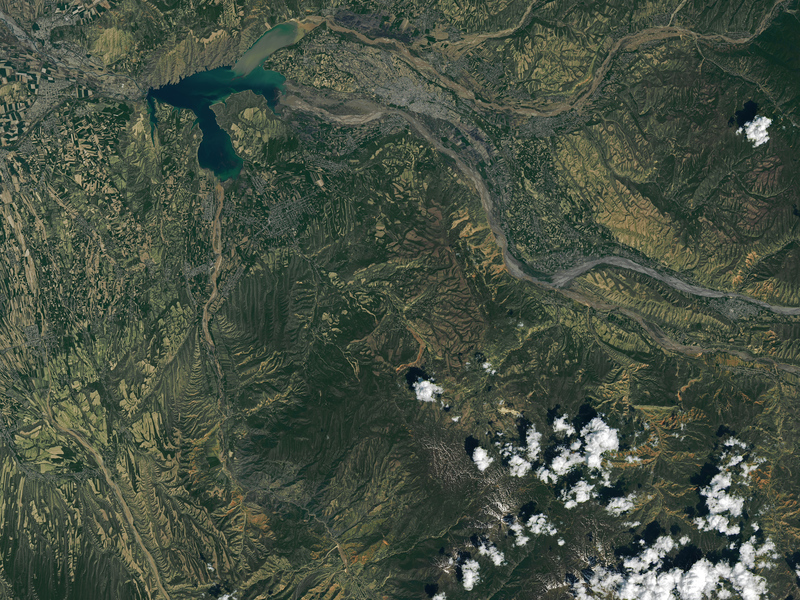 Séries Temporélles (2017, July 18) Landslides in Kyrgyzstan captured by Sentinel-2. Accessed May 23, 2017.